Your resource for initial dynasty and rookie drafts, advice and analysis to dominate your league. 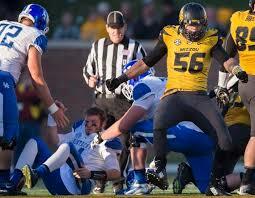 OLB/DE Shane Ray, Missouri 6’ 3” 245 lbs. Cons: The first thing I noticed is that he is a bit awkward moving laterally, not smooth. Ray has a bad habit of letting blockers into body, but has a powerful enough torso to move them around to where he wants. The defender needs to be more proactive and attack instead of letting the offense come to him. There are times he gets too aggressive though and works himself out of the play. His instincts are good, but he needs to understand better what the offense is trying to carry out. Ray needs to get stronger against the run, stepping up and filling the gap. I thought he looked a little stiff dropping back into pass coverage and might be more of a pass rushing specialist. Pros: He usually lined up in a three or four point stance, getting quick, initial penetration. The defender identifies and breaks on the ball quickly with little wasted movement. Ray has a good motor willing to chase the ball carrier twenty plus yards down the field and is a very excitable player who tries to fire up his teammates. He has quick feet, good vision, a solid wrap-up tackler, and enjoys smashing anyone with the ball. This includes a nice chop that forces fumbles. His balance is outstanding; there were times he almost got to a 45 degree angle to move around his blocker. He uses swim moves, spins, and punches to try to create separation. The defensive coordinator used him on many inside stunts, flip-flopping with the defensive tackle to wreak havoc in the pocket. Ray is sometimes unconventional by allowing his teammates to collapse the pocket and he lays in wait to strike when a signal caller comes stumbling out. When he can’t reach the quarterback while rushing, the defender always gets his arms up to knock down or impede the throw. Overall thoughts: While I love his effort as a pass rusher, Ray is too small to play defensive end. He is a bit stiff-hipped dropping into coverage, so can he make a living rushing the passer on over 66% of his snaps? It will take a special defensive scheme and coordinator to get the most out of him. I’m afraid he might become like the Eagles 2014 first round selection Marcus Smith, a miscast defender. In dynasty, I am staying away from him. If you enjoyed this article or any of my other efforts, please donate using the PayPal button at the bottom of the page. Also, please follow me on Twitter @AndrewMiley or the site @Dynasty_Blitz. « Kenny Bell: Could he surprise?